Fikus Visualcam offers a quick, flexible and functional solution for programming NC cutting machines. 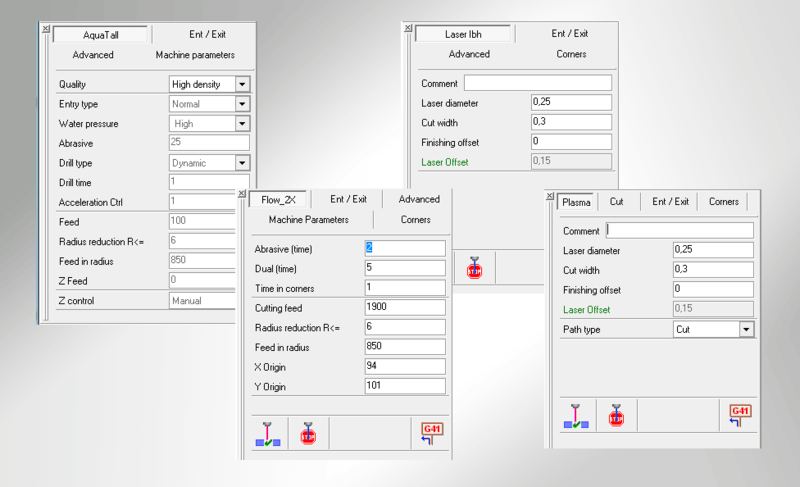 Fikus allows to generate the machining programs quick and easily because of its intuitive interface and advanced specific functions for every machines type. All the cutting machine technologies are supported with specific parameter tables and postprocessors. Fikus is a complete solution for cutting parts by means of a laser, oxyefuel, waterjet, plasma machine or plotter. The cutting options with multiple contours compose the basic system. The technology and stop points are placed graphically and interactively on the screen. Complete solution.- From the geometry design to the generation of the NC machine cutting program. 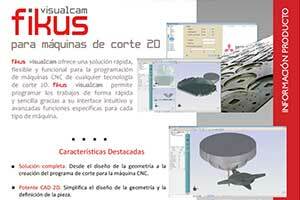 Powerful 2D CAD.- Simplifies the geometry design and the part definition. Advanced functions.- Reducing the production time for the most complex parts. Specific functions.- All the advanced functions in any cutting technology is available in Fikus Visualcam. 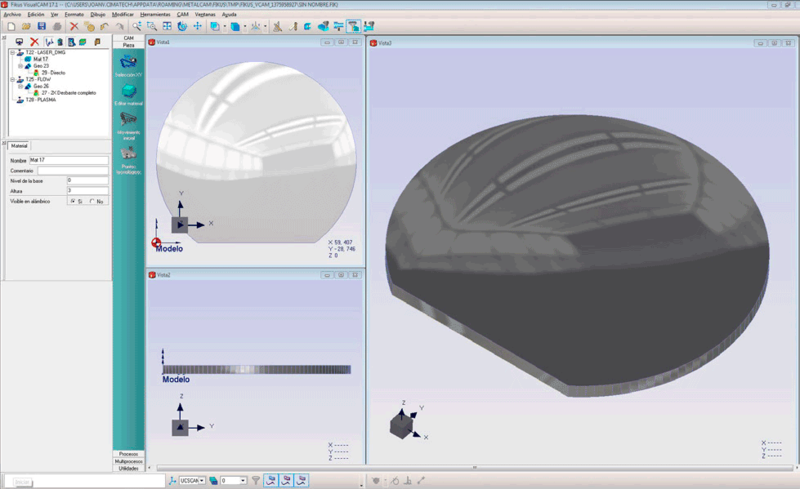 Fikus enables the creation and modification of required geometry, as well as importing geometry from other CAD systems via IGES,DXF or PLT. In addition, it provides an unlimited undo/redo, intelligent trimming, print with preview, as well as specific gear creation functions. Functions to generate and modify the wire geometry. Contours extraction and surfaces handling. Creation of gears, texts and geometry dimensioning. Quick functions bar for move, copy, scale and modify the geometry. The CAM Manager leads the user through the logical sequential process of the programming, from defining the geometry and creating the part to cut, to the process definition and calculation. 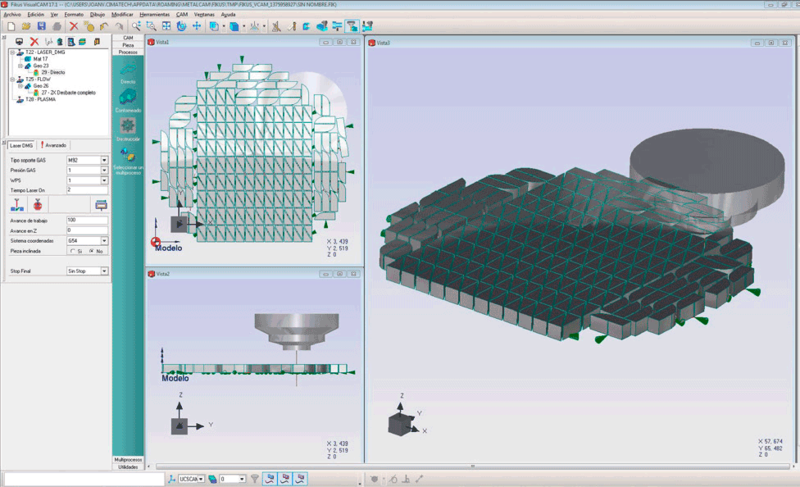 Fikus for NC Cutting & Routing has been specifically designed to produce cut geometries programs easily and quickly, with dynamic OpenGL rendered graphics and a intuitive interface, making the learning process easy. Fikus offers many tool designed to increase productivity and reduce drastically the production time. Templates, customized databases or technological points help user to reduce the production time. Fikus Visualcam offer functions to copy, duplicate, rotate or invert the geometry generating polar or rectangular matrix. Fikus allows also the cutting optimization, customization of the cutting order and, optionally, a powerful nesting module. All the advanced functions included in Fikus, as templates, customizable databases, technological points, cutting path optimization or transforming functions allow the user increase drastically the productivity. Fikus for 2D cutting & routing machines includes all the advanced functions with specific parameter tables for any technology (water pressure, abrasive, penetration, cutting width, laser diameter or power for laser machines, etc.) and dedicated post-processors. The final part (2D) can be shown in a 3D realistic way as a solid or as a wireframe, together with the cutting tool. 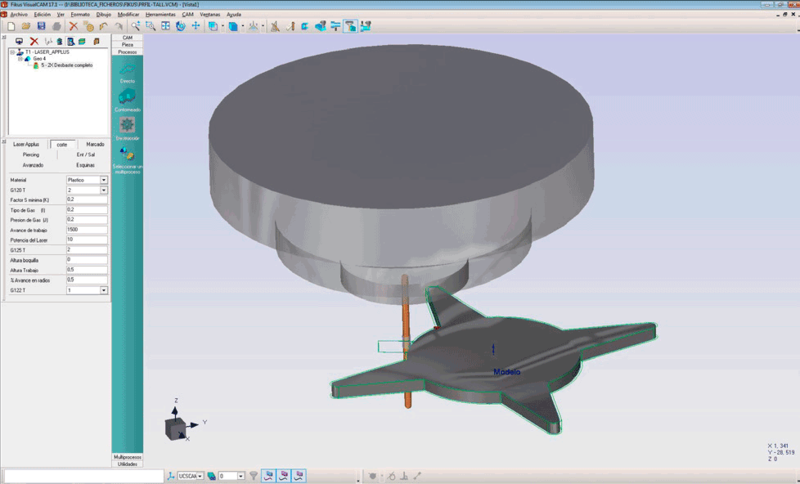 The machining simulation is shown as solid to offer a realistic view of the process and final result. Let now Fikus Visualcam do all the calculations in just seconds and you already can simulate all the cuts in your computer. The Path Simulator will show the part, the material and the wire as a solid. Finally, you can generate your machine programs using the Fikus Visualcam dedicated postprocessors. You can also verify the G-Code program with Ficed, the CNC program editor, and even send it directly to the machine. Finally, you can generate all the documentation needed for the shop floor, according to your preferences, including information as wire threading points and cutting order.